Tuesday September 10 1907 I had my work done early and was helping with the sewing every spare moment I had. Mother says she is getting on fine with the work. Weather pleasant. Wednesday september 11 1907 I had a little time to sew in the forenoon. went to town for things needed in afternoon. Miss [Weis?] is working on my white dress. The boys busy at the same work. Thursday September 12 1907 I had a little time to sew before dinner and put in a good afternoons work. Miss [Weis?] is coming on with both my thin and white dress. Weather pleasant. Friday September 13 1907 I helped with the sewing some and ripped up my brown cloth dress and worked it. Will finished the plowing late in the afternoon. Miss [Weis?] has about all done to both my dresses. She started my [illegible] skirt. 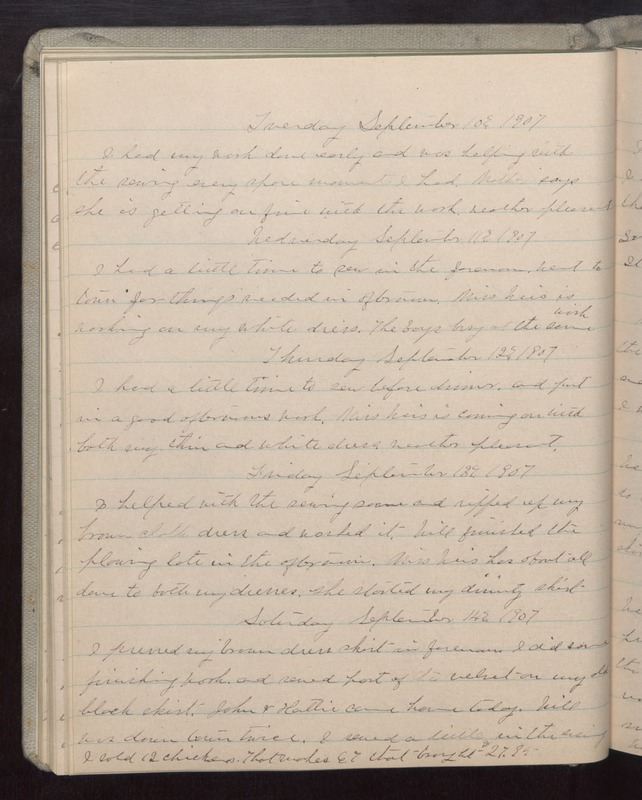 Saturday September 14 1907 I pressed my brown dress skirt in forenoon I did some finishing work and sewed part of the velvet on my old black skirt. John & Hattie came home today. Will was down town twice. I sewed a little in the evening I sold 12 chickens. That makes 67 that brought $27.95.